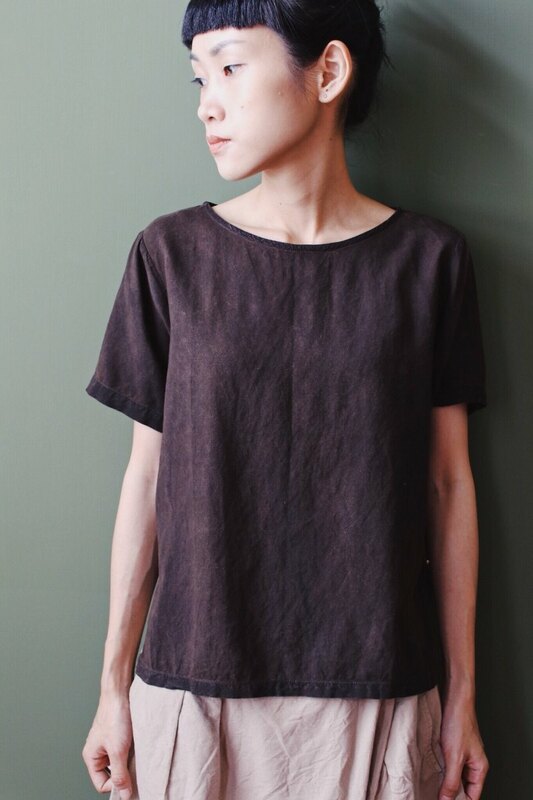 / Product description and story / We stitched brown and red stitches on the side of this top with a matte. Vaguely presented in the corner The material is the natural persimmon dyeing method we have made from the northern part of Thailand to the city of Phrae! Repeatedly dyed to give the fabric a beautiful, leather-like dark brown Because it is hand dyed cloth, there is a slight uneven washing feeling! / About Persimmon Dyeing / Persimmon fruit is different depending on the type of dyeing method Skin and pulp can be used as dyeing materials The production method will first squeeze the fruit into juice and then store it for 2-3 years. After the filtered juice is filtered out of impurities, the dye can be started. Persimmon juice has good color fastness on fabric because it has rich tannins and gums. Very washable and light fast, the longer the color, the darker the color Repeated dyeing can also dye a leathery texture Can dye brown from brown to dark brown In Japan, persimmon dyed cloth will be exposed to the sun to make the color darker. Therefore, it is commonly known in Japan as persimmon dyed for the sun! ▲Model height: 160 (cm) ▲Material: cotton and rayon blend ▲ color: dark brown ▲ size (cm) Length 52 Clothing width 49 Sleeve length 20 Collar width 23 /Designer and brand profile / We love to travel and discover cultures around the world. Then draw inspiration from this, through second-hand re-production, stitching design Create unique products. We also value materials and hope to use environmentally friendly methods. Does not cause a new burden on the earth, such as . Cannabis roots: can be planted without too much water, and can be made of durable things. . Organic cotton: Made in nature, reducing the damage that chemical cotton can do to the planet, while also protecting the health of farmers. . Ethnic embroidery: Through the embroidery of the Remake minority, we hope to continue the common world heritage of mankind. . Natural Dyes: The use of plant-based dyes, in addition to reducing damage to the human body, can promote traditional aesthetic wisdom. Omake is the meaning of a Japanese gift. We hope to bring a little surprise to the world through culture and design. (O+Make)=We have worked with the world to develop cross-cultural and interesting products.